In Part One, we looked at the visual processing mechanism and hopefully began to understand the importance of treating this area in our VT rooms. Our eyes gather the information, our brains processes the information, and with any luck, an appropriate response is created. This applies to reading a book, opening a door, catching a ball; pretty much any and all activities completed with the benefit of vision. My rule of thumb is if your eyes are open, vision is involved. My role is to figure out how. As an aside, for anyone who attempted the locked door experiment from Part One, I have nine keys on my key ring and it took me just over 4 minutes to get the door open. Imagine for a second the frustration level a patient experiences when the most mundane and seemingly mindless task takes this amount of time and effort. A big step in working visual processing, at least in my VT room, is moving the patient away from their common and somewhat programmed responses, and forcing them into uncharted territory. This could mean a different scheme for communicating about a task, this could mean a different set of guidelines for processing information, or it even could mean revamping the system all together to keep them in the process. Obstacles we face in this teaching may include a patient’s self-doubt, a patient’s tendency to reach a conclusions without considering all the pertinent information, and even basing today’s response on previous experiences in the world rather than relying on, or dare I say trusting, the information they see in front of them. And so the conundrum is born. Remember this? 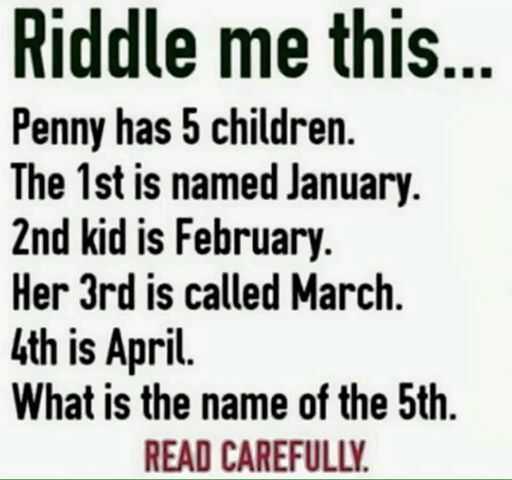 The 5th child’s name is “What”. Notice the final line is written as a statement, not a question, although we assume it’s a question based on previous experiences with sentences beginning with the word “what”, which causes confusion. We all saw the period at the end of the line, but most people probably read it as a question anyway. But even with all this, the sky looks green! Do you decide to believe what you see, or do you remain convinced the sky is blue based on your previous experience and knowledge of the world and therefore assume because your answer is different, you must be wrong? Again, this is how the vision versus logic equation begins. It takes what we visually perceive and rams it head first into what we think we know to be true. When those two pieces of information do not align, we’re forced to make a choice. Often times those choices include self-doubt, over thinking, and one of my favorite phrases “paralysis through analysis”. Even still, in order to manage a day, we have to choose a path. Do we trust the answer we think to be true, or do we trust what we see?As you might imagine, this can be an emotive process. How do we choose? Don’t assume every patient will solve this conundrum the same way. Chances are, solutions will be pretty split across board. Stay tuned for Part Three when we talk about ideas for addressing this in the therapy room! Posted on September 7, 2016, in From My Perspective.... Bookmark the permalink. Leave a comment.